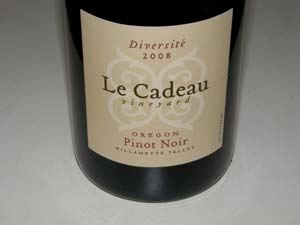 Le Cadeau Vineyard is located on the southern tip of Parrett Mountain, near Newberg, OR in the Dundee Hills. 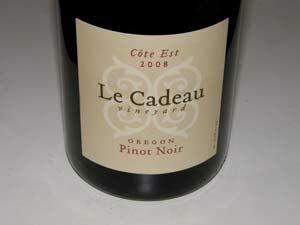 This 14-acre, high-elevation (610’ – 725’), vineyard was developed and planted with a singular focus on growing distinctive, complex, estate Pinot Noir for Le Cadeau. 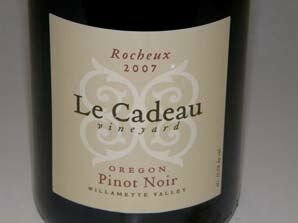 Le Cadeau is known as "the rockiest vineyard in Oregon." It took a team of track-hoes, D-8 Cats, and tractors pulling assorted farm equipment more than two years to clear the raw land. But the effort and cost was worth it to owner Tom Mortimer who is a Burgundy freak. The advantage to planting vines in this rocky volcanic soil is that it promotes drainage, regulates temperatures, and reduces vine vigor--the result is small fruit clusters with little berries that produce rich, fragrant wines. 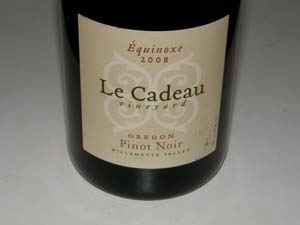 Four Pinot Noirs were produced from this vineyard in 2007 and 2008: Côte Est, Diversite, Rocheux and Equinoxe. The four wines are vinified by different and changing prominent Oregon winemakers (including names such as Steve Ryan, Josh Bergsgtrom, Cheryl Francis-Sam Tannahill, and Harry Peterson-Nedry), making for an interesting mix of wines from the same vineyard. A second label, Aubichon, was introduced with the 2007 vintage. This offshoot is crafted by winemaker Jim Sanders, is made from non-estate fruit and is lower priced. The Le Cadeau wines have received high praise from the wine press since 2005. The wines are sold through a mailing list with some retail distribution. Tours and tasting by appointment (612-799-8969).